I purchased this 998r new from Bruce Meyers at BCM in 2002. It has minor mods: slipper clutch, 27mm offsets, 60mm Silmotor Exhaust, Mag Wheels, Corse underseat oil catch can, quick change sprocket, Brembo radial brake master cylinder. 154rwp with exhaust on bcm dyno when fresh. It has won numerous CCS and WERA expert races and will be competing again in 2008 in WERA. Of the four ducati’s we own, this is our favorite. 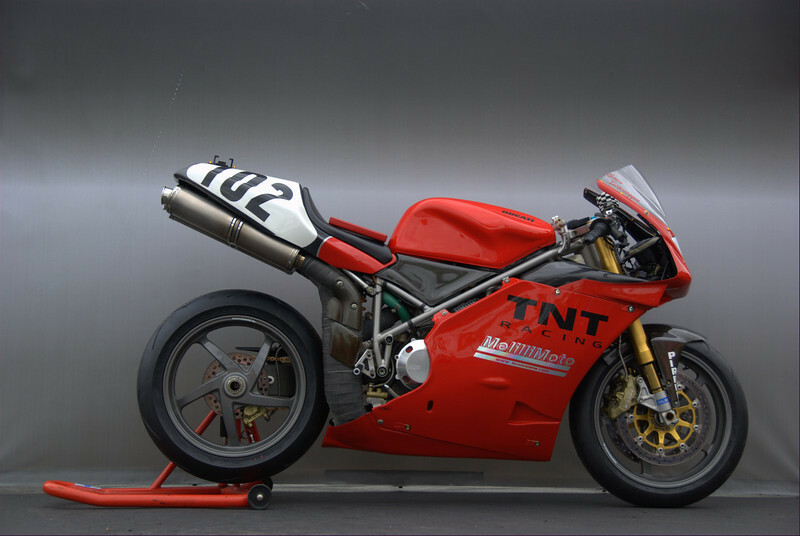 This bike is a true testament to the reliability of the ducati testastretta engine. Thanks to Sebastian at Melillimoto for tuning and maintaining the bike for the last four seasons, we really appreciate your help and expertise. Thanks to my son Josh for being the ultimate pit crew (rear tire change in less than 30 seconds!